Mariners Latest: Vargas: To Trade or Not To Trade? Vargas: To Trade or Not To Trade? Jason Vargas has been very reliable this season and continued his display of that reliability yesterday when he defeated the Royals. Vargas gave up only one hit through 8 innings and allowed one run. The Mariners won the game 4 - 1 and handed Vargas his 11th victory of the season. That marked a career high for Vargas and helped raise his value to the Mariners. The value is where the question comes in. Is he valuable enough to land some pieces that Seattle needs to start hitting the ball again? Many would assume that the Mariners are continuing to look for young talent to add to our organization, but it has been stated many times that the Mariners are looking for a veteran that can come in and hit now and help the core of this young offense hit as well. The other side of that coin called value is, how valuable is Vargas to the Mariners? His 11 wins are the most on the club and his pitching style may be more valuable at Safeco Field than it is on the road. Vargas is a fly ball pitcher and has a tendency to give up the long ball. 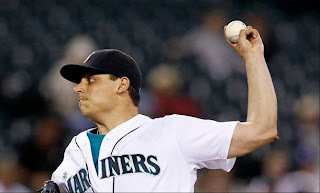 Other teams may view Vargas as a number 5 pitcher, where the Mariners have slotted him in as the number 2 starter. The factors that will help us figure out Vargas' value is looking at what perspective replacements are out there. Blake Beavan, Erasmo Ramirez and Hector Noesi have all fought for a spot in the rotation and have all had some bumps and bruises along the way. Noesi doesn't look like he will be coming around anytime soon, where Beavan and Ramirez may be everyday starters already. The other guys we have to look at are Taijuan Walker, Danny Hultzen and James Paxton. Hultzen is the only one to make it to the AAA level thus far and hasn't exactly found a groove there yet. I'm sure it won't be long before he finds his way and I would bet that we see Hultzen in September with the major league club. Vargas isn't the player that fans would go ape crazy over if he were traded, but he is one of the last pieces that the Mariners have that has been consistent at all. After trading away Doug Fister last year, the Mariners have the reputation of trading away our only good players to get young, inexperienced players that have yet to prove themselves. I like Vargas and I would love to keep him around, but I want to see a proven commodity at the plate. Albert Pujols, Prince Fielder, Josh Hamilton, etc. Yeah right! I know that we don't have a chance in all get out to get any of those guys, especially since they are all in contending teams. We would have to look at non-contenders to land any great bats and we would also have to add some of our own prospects to force a deal to go down. That would mean that Vargas' value to another team would have to exceed the value that he is to us and without being in contention, that just isn't going to happen. Final thoughts: Jason Vargas is not going to draw the kind of talent that we need on his own. The Mariners would most likely have to deal a young arm and/or a good hitting prospect to attract any kind of attention from other clubs and I don't see that happening. Look for Vargas to be a Mariner through the end of the year and if not, look to be very disappointed in the return that the Mariners get for what is given up. I would rather keep him and set our sights on the off-season. Viva Las Vargas!! !